The great civilization of the Ancient Maya serves as one of the most well-known indigenous cultures of the Americas. Dating all the way back to 2600 B.C., the Maya inhabited prominent areas throughout Central America, including Mexico, Guatemala, Honduras, and Belize. During their reign, the Mayan people constructed thousands of large, impressive cities and ceremonial sites throughout the region. Yet, though this ancient civiliziation populated an expansive area, the Mexican state of Quintana Roo on the Yucatan Peninsula held special significance to the Maya. Between the 4th and 10th centuries, this region was considered the ‘gateway to the Mayan world,’ and, today, the Yucatan Peninsula remains peppered with the ruins of the Maya’s spectacular metropolises. If you are planning to travel to the Yucatan, these awe-inspiring archaeological and historical sites of the ancient Mayan civilization are absolute must-sees. Prepare yourself to take a step back in time and enter into the ancient world by exploring these top five Mayan ruins of the Yucatan! Probably the most famous of the many ruins in Mexico is the sprawling city of Chichen-Itza. Constructed between 600 A.D. and 900 A.D., this magnificent city served as the regional capital of the Mayan world and provided a central point from which the Mayans exerted their power throughout the various areas of the peninsula. This city also contained one of the most diverse populations of the Mayan world, and thus possessed unique and varied architectural styles. The central structure of the city, known as the Kukulkan Pyramid, remains the most iconic and imposing structure of Chichen-Itza (and, consequently, the most well-known). Due to its massive structure and grand importance in the Mayan world, this pyramid was named one of the new wonders of the world in the year 2007. Pro Tip to Visiting Chichen-Itza: Due to its fame, this archaeological site becomes quite crowded during the day and on the weekends. To enjoy the magnificent city without the large crowds (and overwhelming heat! ), try to arrive right as the site opens (generally at 8 AM). During the 13th and 14th centuries, Tulum served as an essential Mayan trading post (namely for jade and turquoise), thus making it one of the most powerful city-states in the region. Tulum, a name that means “wall,” was built to be a mighty Mayan fortress: with walls on three sides and the sea on the other, Tulum was well-protected. The site’s proximity to the water also allowed it to serve as an essential sea port, which connected the Mayans in the Yucatan to those in other regions of Central America, including Belize and Guatemala. The city’s original name, Zama, means “place of the dawning sun.” So, as you can imagine, this ancient city is absolutely stunning: it is the only Mayan city that is magnificently located on a jagged cliff overlooking Tulum’s sparkling turquoise water. Pro Tip: Go early in the morning, right when it opens, to avoid the crowds! Located near Merida, the capital of the Yucatan state in Mexico, the ancient city of Uxmal is one of the most visited Mayan ruins in Mexico. Surrounded by luscious green jungle, it is also one of the most beautiful. The city is considered one of the most important archaeological sites of the ancient Maya and best represents the region’s architectural style of all the Yucatan ruins. Uxmal is also home to the huge Pyramid of the Magician, which, due to its impressive height and rounded sides, is considered one of the Maya’s most unique structures and has been named an UNESCO World Heritage Site. The ruins at Coba can be found deep withinin the Yucatan jungle, just 30 minutes from Tulum town. Coba contains the largest network of stone causeways of the ancient Mayan world, and it consists of a variety of archaeological sites connected by winding jungle pathways. At its center lies a tall pyramid, one of the last Mayan structures in the Yucatan that visitors are still allowed to climb! While the climb is a little tough (and steep! ), the incredible view at the top is certainly worth the struggle. Pro-Tip: Once there, rent a bike for just four dollars and ride along jungle paths to the various archaeological sites before heading to the center to climb the main pyramid! Also, plan time to visit the many cenotes nearby, where you can escape the heat by descending into large underwater caves and diving into cool, crystalline waters. A little further inland from Coba near the colorful city of Valladolid lie the ruins of Ek Balam. While not as giant as the famous site of Chichen-Itza, the ruins in Ek Balam are both less crowded and, like the Coba ruins, climbable! 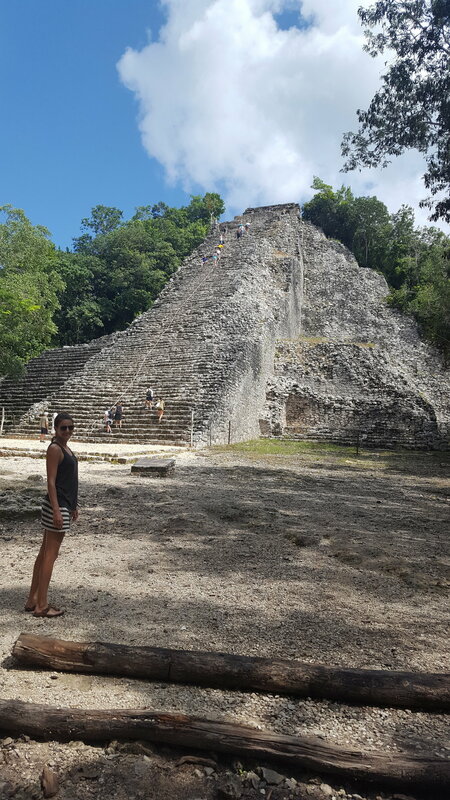 Climb to the top of the pyramid and gaze around at other imposing Mayan structures towering up from the jungle; it is an unforgettable experience! 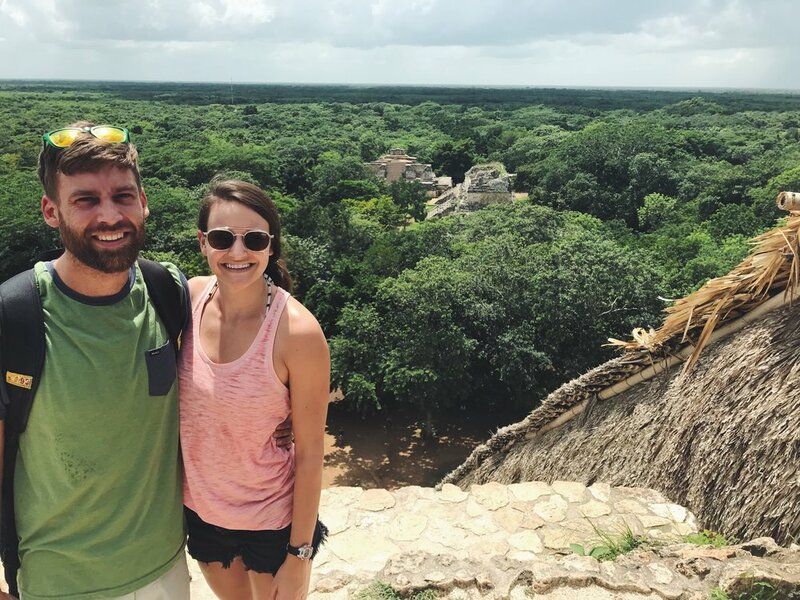 Pro Tip: Plan a day to visit both the ruins of Ek Balam, as well as the cenotes nearby! Then, for lunch, head into the vibrant city of Valladolid to taste the delicious flavors of an authentic Yucatecan meal! The beauty and grandeur of the ancient Mayan ruins are simply unparalleled; they tell the unique story of a fascinating people group. They also provide insight into our own human history, serving as a testament to the power, determination, and resilience of the human spirit. Don’t miss the chance to see the world through the eyes of this ancient civilization by visiting these breathtaking ruins in the Yucatan!